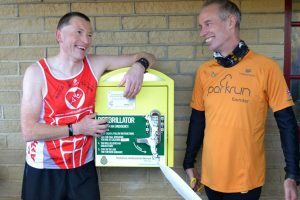 Sean Hoyle (left) and Parkrun founder Paul Sinton-Hewitt unveil the public access AED in Greenhead Park, Huddersfield. And the 48-year-old father of two could have been forgiven for being emotional when he joined 690 other runners at Greenhead Park in Huddersfield – for his 100th Parkrun. Sean, of Brockholes, was about to start his seventh Parkrun in 2013 when he collapsed from a massive cardiac arrest which left him with only a 6% chance of survival. Only the swift attention of medics – and the use of a new chest compression system – saved his life. Parkrun founder Paul Sinton-Hewitt (right) meets cardiac athletes (from left to right) Roland Malkin, Glenn Davies and Sean Doyle at Greenhead Park, Huddersfield. Three years on he is a regular at the weekly Saturday morning gatherings at Greenhead Park, one of the largest in the country. 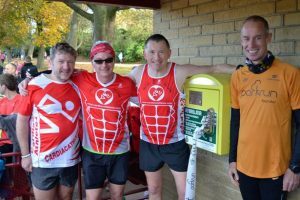 Joining Sean at the milestone event was Parkrun founder Paul Sinton-Hewitt, who cut a ribbon to officially celebrate the purchase of an Automated External Defibrillator, a speclialist device that could save more lives. Fundraising from the Parkrun community and Huddersfield Pennine Rotary Club means the machine will be made available to the public in a secure box. 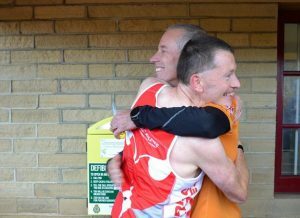 Sean Doyle (right) and Parkrun founder Paul Sinton-Hewitt embrace after unveiling the public access AED in Greenhead Park, Huddersfield. Sean Doyle finished 41st on Saturday’s run with a time of 20:53. Dave Tuttle’s cardiac history was textbook. Years of smoking and sedentary ways had taken their toll. In his late 40s, he got out of breath — and had angina — walking up a hill. A quadruple heart bypass was his final wake-up call. Dave Tuttle of Buffalo, N.Y., runs a recent race. That was 11 years and thousands of miles ago. Determined to take control of his health and life, Tuttle took up running. Today, at 57, he looks the part of the endurance runner he has become. Slender and fit, Tuttle has completed five marathons and runs as much as 50 miles a week, logging every single one along the way: 9,073-plus miles and counting. “I feel great. I had couple of cardiologists tell me it’s the only reason I’m alive,” he said. Tuttle, who lives outside Buffalo, N.Y., has close running ties to Harrisburg. He is a member of Cardiac Athletes, who, as their name implies, have overcome cardiovascular episodes to become runners, swimmers and tri-athletes. The Harrisburg Marathon , with its central location, flat course and ideal November conditions, has become one of the group’s favorite venues. This year, when Cardiac Athletes return to run the marathon in November, it will donate to the New Cumberland EMS an artificial exterior defibrillator — an AED — that it purchased through a fundraiser. 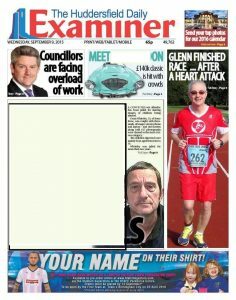 A few years ago, the New Cumberland unit used an AED to resuscitate a runner who had collapsed near the finish line. 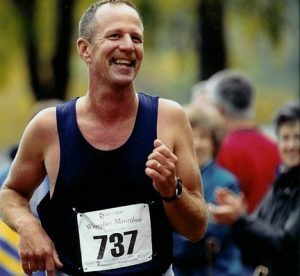 “He is still alive and kicking today,” said Chad Krebs, race director for the Harrisburg Area YMCA. The race, which grows annually, had its biggest turnout last year, with 900-plus individual runners and some 350 relay teams. Krebs hopes to hit 2,000 runners this year. Anderson couldn’t be more right. Walsh said he has several patients who have trained for ultra-marathons, which can entail 50 and even 100 miles of running during one event. “Most patients just don’t hear that message. The ones that do we are very happy about,” he said. These days, once they give patients the green light, doctors like to see them out of bed within three days and in an exercise regime within the week. “We like to get them up doing things. We like to see them doing something five to six days a week,” Walsh said.